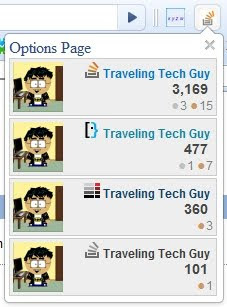 Just a short update: I updated my extension and uploaded it to the Google Extensions sites. You can find it at http://tinyurl.com/SOExtension (Chrome version 4 and above and a StackOverflow profile required). Version 1.2.0 now supports Meta.StackOverflow, utilizes the latest jQuery library (1.4.1) and fixes an annoying bug - all those by requests from users (see comments on that page). Update 2: Just updated to version 1.2.1: The options page now includes instruction on where to find your Profile ID - thanks for the suggestion Sasha!